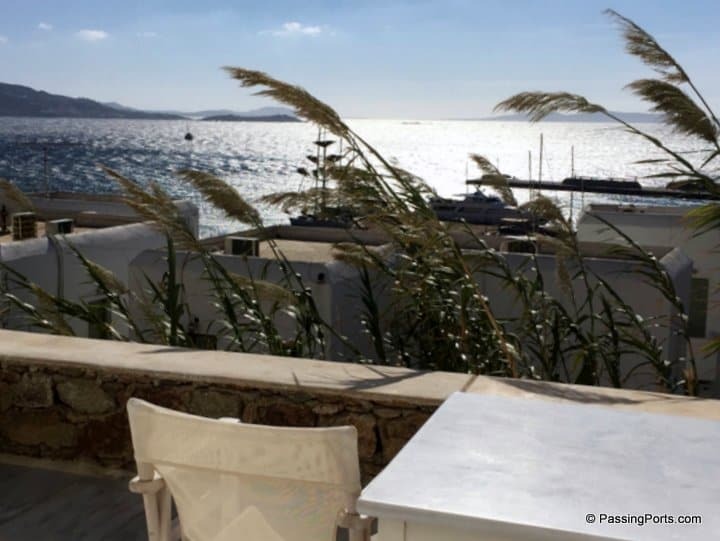 Mykonos – To Miss Or Not! 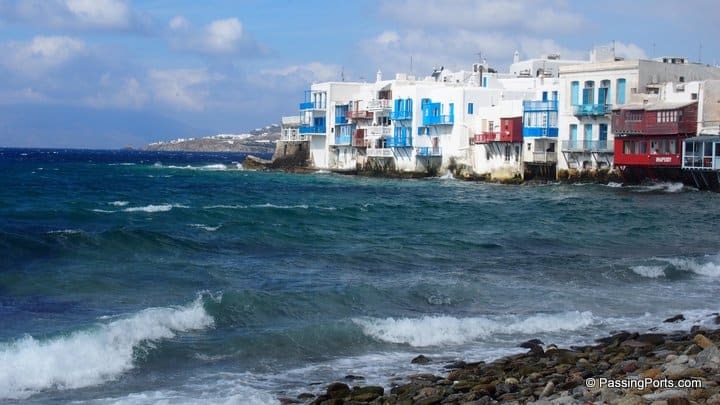 Mykonos has many faces than just being a beach party destination. 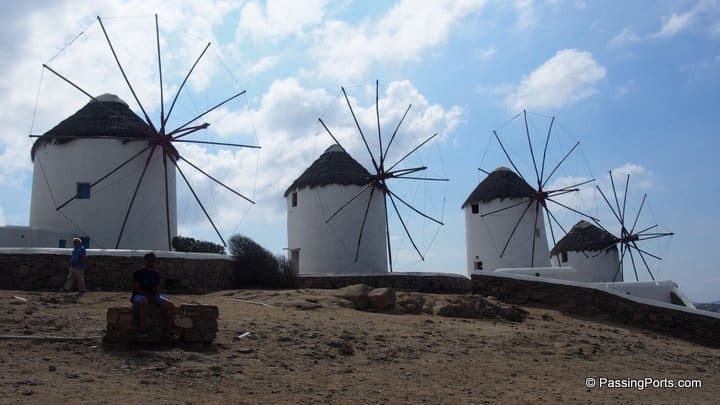 It has lots of those ancient windmills that Greece is famous for, white and red top (instead of the blue unlike Santorini) buildings, a sneek peak of Venice called Little Venice, pelicans walking around with their head help up high, gay bars and many shopping streets. Santorini had already given me a high with its beauty and I couldn’t wait to see what this island had to offer. We rented: Car for a day (recommended by the hotel). Booking in advance helps in getting better cars at better prices. *This island seemed more expensive than Santorini. 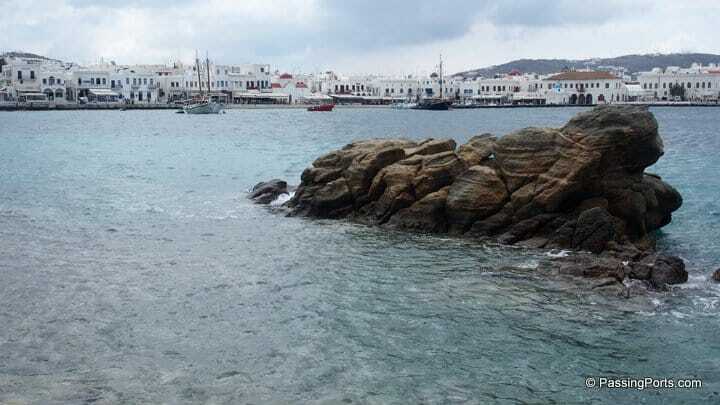 We arrived at Mykonos around 1440hrs and walked about 5 mins to reach Olia Hotel. 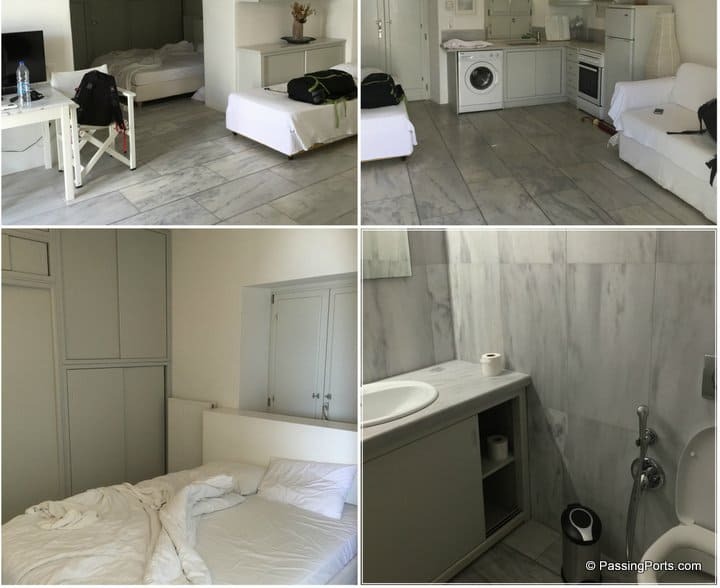 This was the most expensive property that we had booked in our entire trip – €48 a night with breakfast. When we entered the room, I was jumping with joy (on the bed to be precise :P). 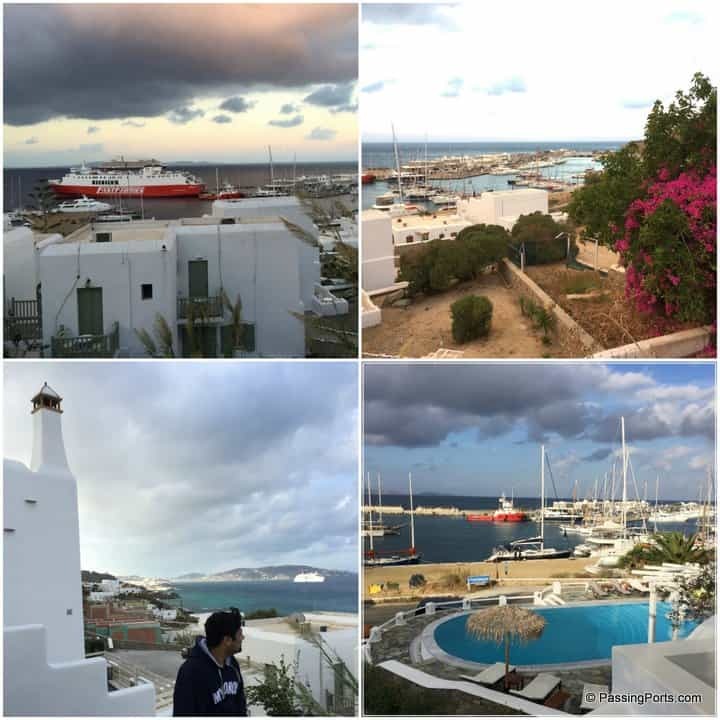 The balcony gave us stunning views of the port while the room, bed, tables, kitchen and the bathroom were ALL WHITE. I knew I was in paradise. After my initial excitement had come down, we went to the reception and asked for a car to rent, picked up a map and prepared our itinerary for the day. This day was really windy, so the person who gave us the car asked us to visit the Lighthouse first to have the best experience – and thank god we listened to him. The Armenistis Lighthouse is at the northernmost tip of the island and the views are absolutely gorgeous. Standing on one end of the island lets you see ships and ferries sailing with a never ending view of the sea. The lighthouse stands tall in the background but the approach was a bit messy. But who cares when the views are this beautiful. The windy day made it more exciting. We then proceeded to the beaches and our first stop was the most famous one – Paradise. 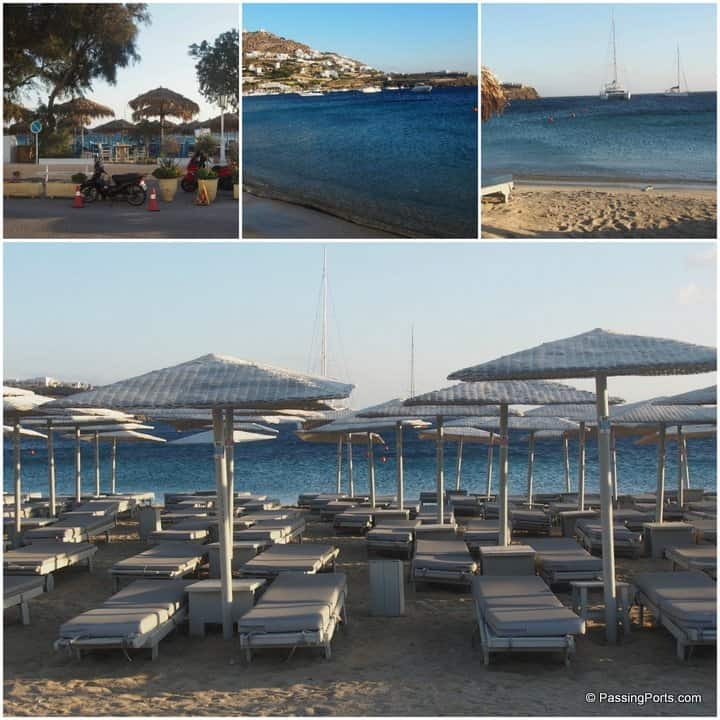 After Paradise, we went to Super Paradise, Psarou and Paraga to catch a glimpse of the golden sands and transparent waters and ended up at Chora for dinner. 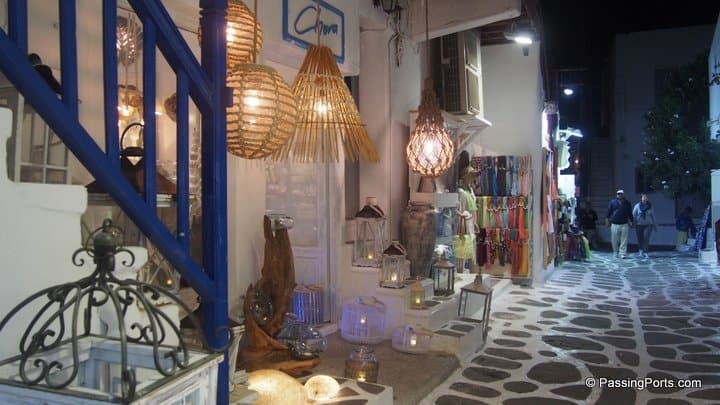 Chora is a market place in Mykonos and the streets were so European (DUH!) and so beautiful – filled with shops of all kinds and sizes – right from clothes, accessories, restaurants, cafes, bars and more. 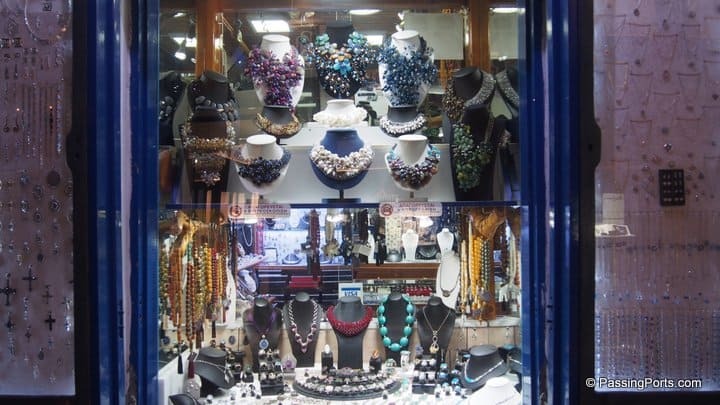 This place caters to all kinds of shoppers – the best unnamed and named brands can be found here. Since we went rather late to Chora, we decided to spend more time the following day. As you can see, you know why we decided to go again :D.
We woke up early as we had to leave this island by night, spent quality time over breakfast and mapped places to see as we had to return the car before 1700 hrs. My husband and I decided to go to every mapped beach, spend only few minutes and head to the next due to lack of time. 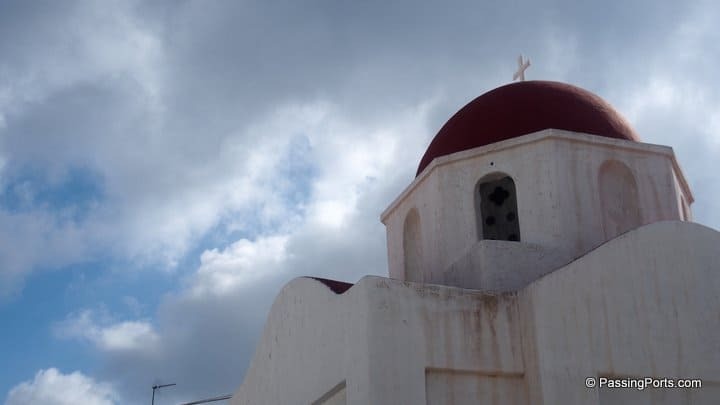 We finished Kalafatis, Ornos, Elia, Panormos and Agios Stefano. Also Read: Athens - Hippie Yet Happening! On route to Elia, we stopped at the Ano Mera monastery which charges for entry, so we took a sneek peak and left without going in. 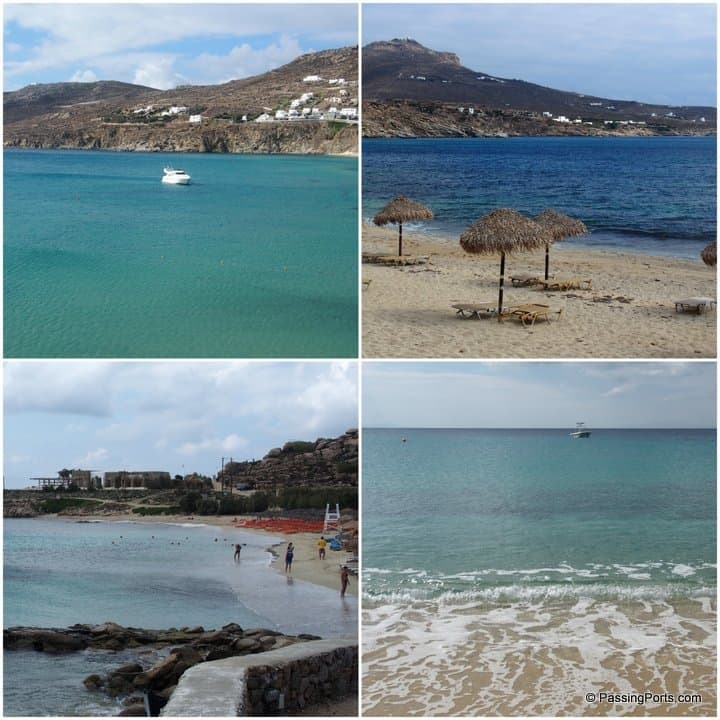 Once the beaches were done, we left to Chora. 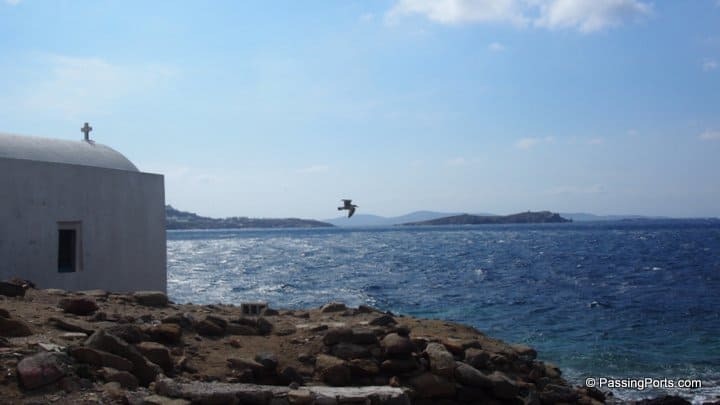 Tip: There are designated car parking in Mykonos and therefore look out for the road signs. We headed to the Boni Mills (the pic on top) and walked all the way to the other side of Little Venice to reach here (the pic at the bottom). 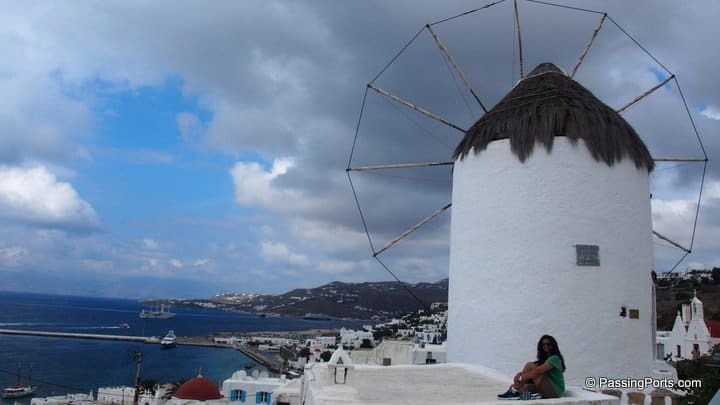 This island is as beautiful and picturesque as Santorini and I went berserk clicking photos. We sat in one of the coffee shops in Little Venice and got lost in time and beauty. 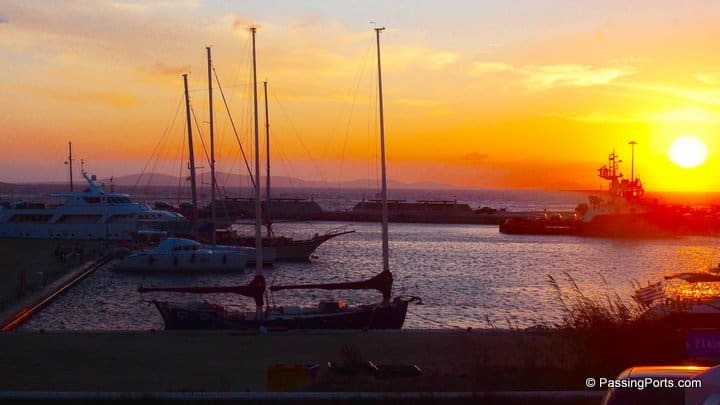 Once we were ready to say bye (oh I was not ready to let go at all) and leave this place, we drove out of Chora back to our hotel and collected our backpacks, returned the car keys and sat in the hotel restaurant to watch the sunset. After finishing our dinner, we walked to the port to take the Seajet ferry back to Piraeus, Athens. We stayed at Hotel Scorpios the night before taking our flights back home. This hotel is not in a great location but offered great views and decent breakfast. 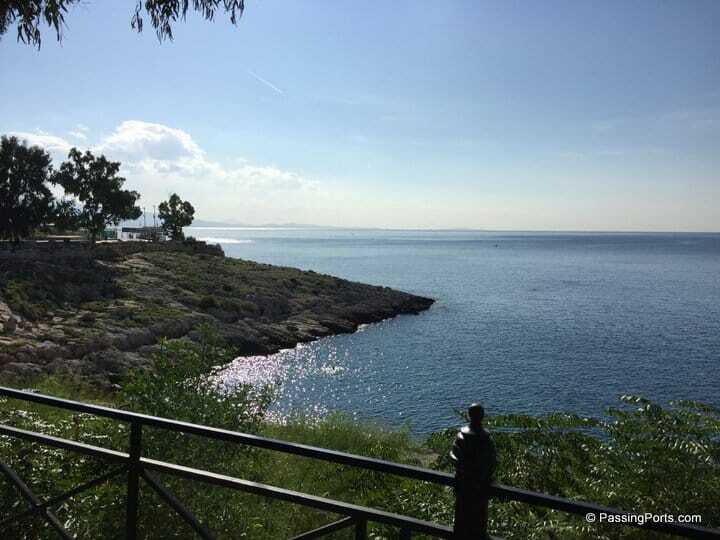 Would suggest to find better places – near the Piraeus Metro if you are flying the same day out. That was it. 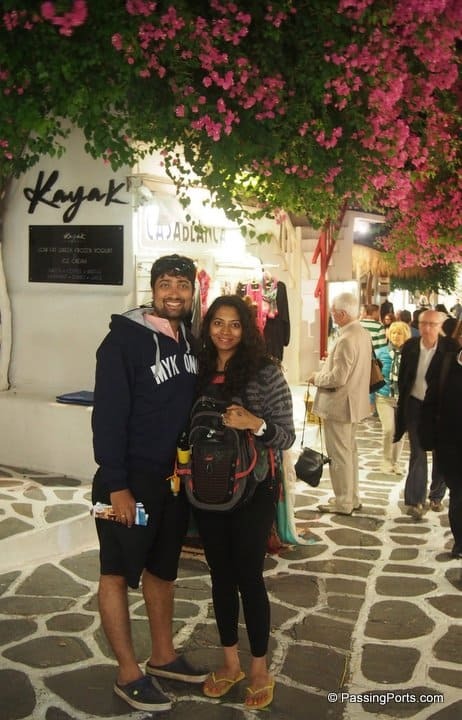 I had come to terms with leaving Greece and going back to Chennai but leaving Mykonos and packing again to the airport was the hardest thing to do. All that begins well ends well and so did our short vacation. Gis Sou Greece (Goodbye Greece)!